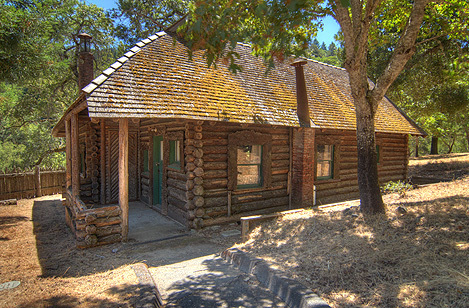 The historic log cabin is located on the northern shore of Phoenix Lake, on the flanks of Mount Tamalpais. The cabin is a remnant of the Hypolite Ranch, a 1000 acre ranch once owned by James and Janet Porteous. They purchased the land in 1883 and established their home there, completing a large twelve-room house in 1886. James Porteous died the following year, leaving the ranch to his wife to manage. 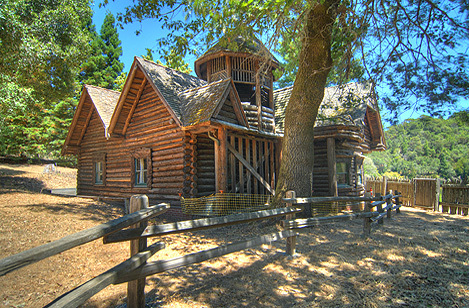 The log cabin was constructed in 1893 to house the ranch foreman, Martin Grant. The redwood logs for the cabin were cut on the Deer Park section of the ranch, located on the north end of the ranch near Fairfax. Janet Porteous continued to manage the ranch until she died in 1904. The log cabin is one of the few remaining historic buildings on the old ranch site. The Porteous home, located up the hill from the log cabin, burned in 1925. A notable feature of the log cabin is the use of “curly” redwood bark used for the front door and as a wide trim that surrounds many of the windows and doors. This unusual bark was removed from a fallen tree found on the opposite side of old Shaver Grade, a historic road that passed through the ranch. Today, the log cabin is on the property of the Marin Municipal Water District. Plans to restore this historic gem are being developed. Select one of the images below to start your tour of the cabin. This virtual tour provides an in-depth exploration of the historic log cabin at Phoenix Lake. You may want to use the following features to enhance your visit. 1. Begin your tour by selecting one of the two images above. 2. The tour consists of 22 panoramic views. Every 360-degree view allows you to look in any direction, to zoom in and out, and to move from one panorama to the next. 3. You can look around and zoom using your mouse (drag and scroll) or by using the navigation bar. 4. There are two ways to navigate from one view to another: select the pulsating white rings visible in each view, or select the Open Navigation Map button to open an interactive overhead view. 5. A few of the views will contain informational text and photo icons. Use these to open a descriptive text panel or an image with caption. 6. Select the Return to Start Page button to exit the interactive views and return to this starting page. This interactive presentation of the log cabin was developed for the Marin Municipal Water District, and was made possible by Mike Swezy, Watershed Resource Manager. The virtual tour, including all photography and text, was developed by Matt Thompson. Digitally preserving our heritage resources. Copyright © 2019 Westhill Digital Heritage. All Rights Reserved.